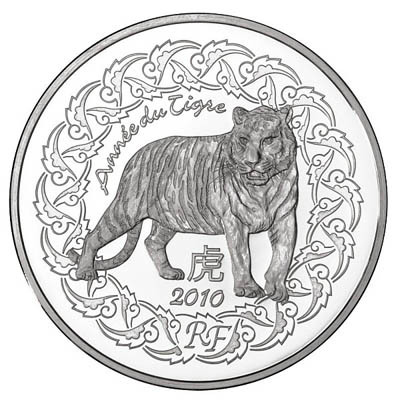 This coin is one of the 12 coins the Chinese zodiac series. It will be dated 2010 and will be the fifth in the series, this time honouring the Tiger. It will depict the tiger in a Chinese frieze and on the reverse there will be a portrait of Jean de la Fontaine and all the animals in the Chinese zodiac. Each coin comes complete in original Monnaie De Paris box with Certificate of Authenticity.